Introduction WiC-3945 is designed with the objective of allowing a battalion scale game to be played in a day session. We spent some time looking at such engagements. In searching books we found an excellent one called Breaking the Panzers by Kevin Baverstock. It is a great read that we fully recommend to everyone. The author’s father was in the battalion as a private in the Intelligence Section, and he built the book from the battle memoirs of participants. The book describes hour-by-hour how the 1st Tyneside Scottish, fresh in Normandy, just about held off an attack by armour and infantry from the 2nd Das Reich and 9th Hohenstaufen SS on July 1st 1944. The main action started at dawn and ran until around 6pm. Rauray is a village to the South West of Caen. Caen was the focus of the British attempts to break out from Normandy, which pulled the best of the German forces into an attrition battle they just couldn’t win. 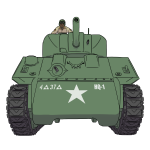 In doing so made it easier for Patton to break out in the West, and became known as the “anvil” of the break out (against which the best of the German forces were expected to break themselves). The book doesn’t have as much on the German forces as it does on the British side, telling as it does the story of the 1st Tyneside Scottish, but we have located some very good sources for them. So this chapter lays out the OOBs and maps for refighting this battle. We have refought it twice and it makes an excellent all-day game. Through the rest of the rulebook we will return to some examples from the battle to give our rules historical context. The 1st Tyneside Scottish arrived in Normandy as reinforcements on 12th June 1944, six days after D-Day. From the 25th to 30th of June it went into action as part of Operation Martlet to clear Brettevillette and Rauray. On the 30th of June they took over defence of the Rauray spur from the 10th Durham Light Infantry. Little were they to know what would hit them at 0600 the next day: an opening rolling barrage and a determined attack by SS tanks and Panzer Grenadiers. Above is a schematic map of the Rauray sector (a full page version is on the website) along with the deployments and lines of attack. The most important features of terrain were the two contours 100 and 110. Contour 100 giving the British troops an uphill position to defend, whereas 110 was a small 2 ring contour of high ground that the British chose not to occupy, settling instead for the better cover of the bocage hedges at the bottom of the slope. Two villages of Brettevillette and Quedeville were German mustering points for the attack, and initial advances came along the lines of the roads from these BUAs towards Rauray. 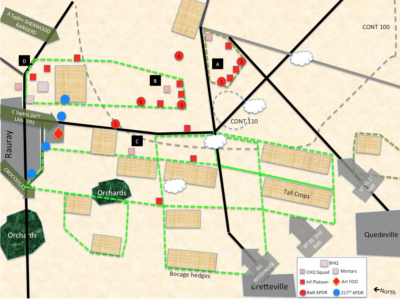 These two roads converge on a field – simply known as the “five-sided field” – that became a cauldron of intense fighting through the morning. All of A Co, 1st Tyneside Scottish was dug in defending it. Being July, the terrain was very lush with growth. Fields were alternately open and ploughed or packed with tall crops that could conceal the advance of infantry. All the main fields had tree lines and bocage hedging around them, giving the British good areas of cover for digging in and the Germans easy cover to infiltrate British positions. There was a notable gap in the hedging between A and B Companies, so they sited no4 6pdr to cover that gap. The two orchards near Rauray became notorious as they were infiltrated by Panzer Grenadiers with snipers who strapped themselves into the trees and stayed behind causing problems after the main force had withdrawn. Five of them eventually surrendered when face with being roasted alive by Churchill Crocodiles. The keys to the defensive success were the dug in ATGs and the FOO/Artillery. The six battalion 6pdr ATGs had been allocated to work with the infantry companies and had been very carefully placed by the section leaders to give enfilading fire and protect each other. The 6drs also had a good supply of the new APDS ammo, which materially improved their ability to penetrate German armour. They had 24 rounds per gun, which in game terms is enough for six shots each. The British FOO, Major Lucas, was connected back to artillery support and had a good view of the battlefield. He was actually joined in person by the CO of the 185th Artillery Regiment, Lt- Col Mackay-Lewis who took over the FOO responsibility directly. By this time they had a full 24x 25pdrs under direct control Around midday, some 6 hours after the first German movements started, they made a rare Victor Target (see HE) request, bringing in all the artillery of two Corps onto this sector. This was a salutary demonstration of allied artillery capability, and it was such massive barrages – combined with the effectiveness of the 6pdr ATGs – that finally broke the German attack. Mark’s History Zone: Victor Target at Rauray This call sign would have brought most of the Corps artillery of VII Corps into action. If all of this had fired, then it would truly have been a devastating barrage. Taking their orders of battle for those date, the total force would have been: 15x 24x 25pdrs = 360 guns, 8x 16x 5.5″=128 guns, 3x 24x 25pdr Sextons = 72 guns, 2x 8x 7.2″ =16 guns, 2x 8x 155mm Long Toms = 16 guns. A massive 602 guns!! Ouch! This barrage famously led to Panzer Meyer quoting Dante in his battle log “all hope abandon, ye who enter here”! The German forces had suffered heavily to allied ordnance prior to the battle. A few days beforehand, on June 29th, the 2nd and 9th SS were subjected to a Corps level artillery barrage with naval guns in support. Then, in addition, the mustering area of the 9th SS was hit by a hundred RAF Lancaster bombers, which caused serious disruption and damage. On tactical missions like this a single Lancaster carried 1x 4000lb HE bomb and 18x 500lb HE bombs. So a hundred of them drop a 3 massive 1,300,000lb of high explosive: 1.3 million pounds! The 4000lb bomb alone has a close blast radius of about 110m and even a tank within it has only about 50% chance of surviving without disabling damage. One can only imagine what terror and destruction occurred – a startling demonstration of the allies late war airpower. It is not surprising, therefore, that it is not easy to determine the order of battle for the German side. We have triangulated sources to give the best estimate we can of the weakened forces involved. Perhaps even more problematic was that the Germans suffered command chaos in the midst of mustering for the attack. The commander of the 1st Bttn, 4th SS Panzer Grenadiers, Adolf Dieckman, was killed in action the day before, and it lost its Divisional HQ that night as well. This left Otto Weidinger (a Regimental commander by grade) to improvise the attack as best he could. The command and control issues and previous barrage perhaps stopped the attack more than the defence on the day, explaining why the attack came in waves rather than having its full force at the outset. It was a credit to the German forces that despite this backdrop they carried out a courageous attack that came very close to breaking through. At the beginning of the attack the German artillery laid a large smoke screen, allowing infantry to approach and infiltrate down the sides of the bocage hedges. The engagement distances were very short, with 6pdrs engaging German armour at very short ranges where even the 45t Panther was at risk to a 6pdr, expecially so with the APDS special ammunition. At 1640 a Churchill Crocodile troop was attached to the Battalion and was sent forward to clear out the lingering German snipers mentioned earlier. By the end of the battle the 1st Tyneside Scottish had just managed to hold its position and had accounted for around 35 Germans AFVs, with the 6pdrs alone having claimed 12. Losses were high with the battalion only having around 200 uninjured men by the end (it absorbed 350 replacements the week after). The claims that it was mainly the infantry and HE that did the damage is supported by the British tank losses being only five Shermans destroyed.